On 20th Anniversary, Northern Ireland Peacemakers Warn of New Dangers - Integration Through Media ....! (VOA): The leaders who brokered a peace deal for Northern Ireland in 1998 marked its 20th anniversary on Tuesday by warning that a hardening political divide and Britain's exit from the EU were creating new dangers for the region. 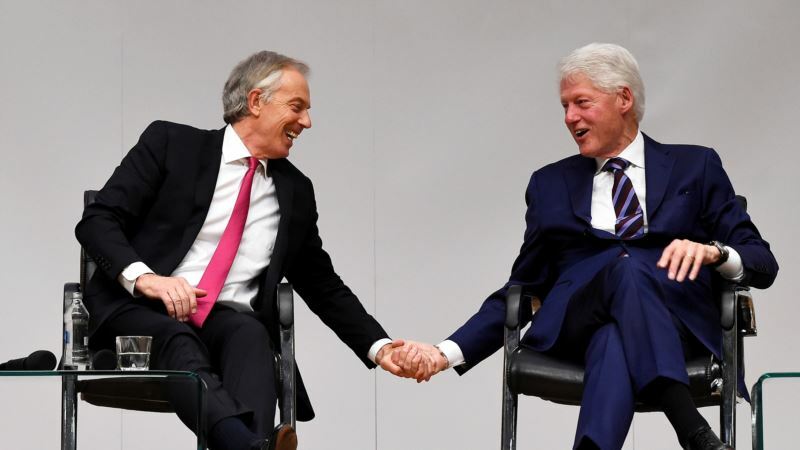 Former U.S. President Bill Clinton and ex-British Prime Minister Tony Blair joined Irish and Northern Irish politicians in Belfast to mark the breakthrough on April 10, 1998, that called an end to 30 years of sectarian violence in which around 3,600 people died. But the collapse early last year of the power-sharing administration at the heart of that deal meant there was no devolved government to greet them — and little sign of the province's Irish nationalists and pro-British unionists resolving the differences that have again divided them. Northern Ireland was quickly transformed by the deal, with the Irish Republican Army, responsible for most of the killings, agreeing to give up its weapons and the British army dismantling its armed checkpoints and withdrawing. But while the outbreaks of violence have all but ended, the region's politics has become more polarized — leading in January 2017 to the collapse of devolved power-sharing for the first time in a decade. The supporter base of Northern Ireland's liberal parties has shrunk, allowing the combined vote of the more divisive Democratic Unionist and Sinn Fein to grow from around 34 percent in 1998 to 56 percent at the last election in 2017. In recent months, the rhetoric from both sides has hardened. “Compromise has to become a good thing, not a dirty word and voters have to stop punishing people who make those compromises and start rewarding them,” said Clinton, whose role in the 1998 Good Friday Agreement is celebrated as one of the key legacies of his chequered presidency. The political tensions have been heightened by Britain's decision to leave the European Union, with some Irish nationalists highlighting the risk of next year's departure leading to the reinstatement of a hard border between the UK province and Ireland, inflaming nationalist opinion. “This Brexit thing can burn you bad if it's done wrong,” Clinton told a crowd at Queen's University Belfast. Blair, who campaigned against Brexit, warned a hard border would be a disaster for the peace deal. British Prime Minister Theresa May's decision to do a deal with the region's largest pro-British party, the Democratic Unionists, to prop up her government has fanned nationalist rhetoric. “The Tory government has actively encouraged the most negative, intransigent and sectarian elements of political unionism to attack and undermine the Good Friday Agreement,” Gerry Adams, the former Sinn Fein leader who also helped negotiate the agreement, said in a speech Tuesday. Some unionists pointed the finger instead at the Irish government, saying its suggestion that Northern Ireland might be governed by EU rather than British regulations — or that it might unite with the Republic of Ireland in the coming years — risked inciting pro-British militants. “I hope people realize that some of the things they are saying are dangerous,” David Trimble, head of the Ulster Unionist Party, the largest pro-British party in Northern Ireland in 1998, told RTE.